Recreating a park or coaster and want to make it as accurate as possible? This is the best way to do it. Before you start, you need Google Earth Pro. 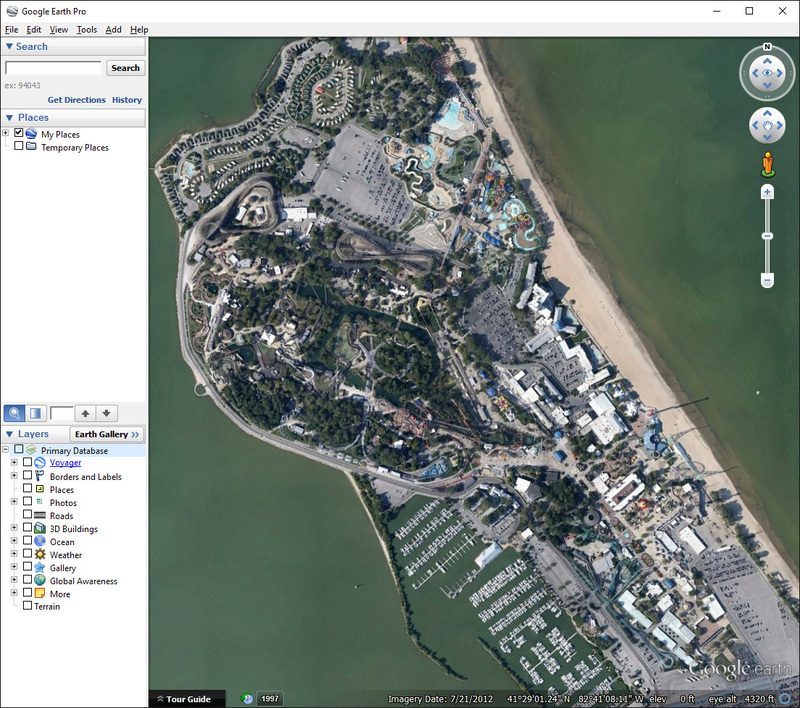 You'll be using this instead of the regular Google Earth as it can save high-resolution images, up to 4800x4800 pixels. The regular Google Earth is limited to your screen resolution. As it says on the page, use your email address and the key GEPFREE to sign in to Google Earth Pro once it's installed. 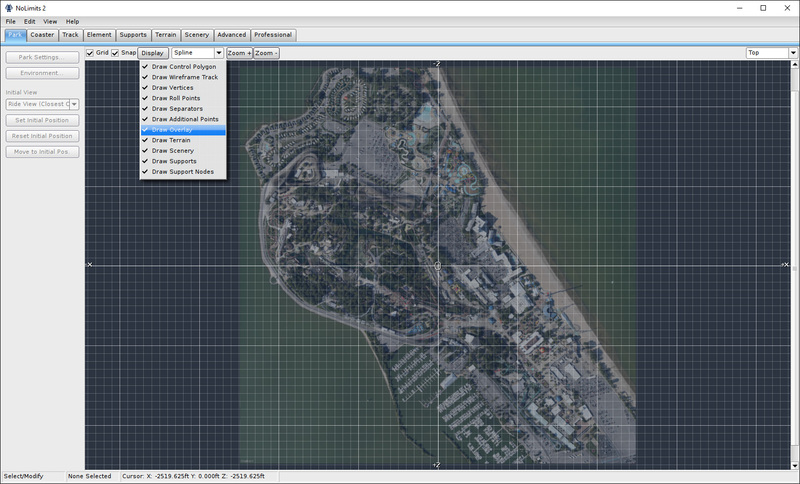 In this tutorial, we'll be making an overlay for Cedar Point. Yes, the whole thing, or at least as much as will fit in NL2. 3. First, zoom and pan the view to exactly the view you want for the overlay. Don't rotate it, keep it North up. If you change the view after this, you'll have to re-do all the rest. 4. Go to Tools>Ruler and change the drop-down box in the Ruler window to Feet if your NL2 is set to Imperial units or Meters if it's set to Metric. Make sure to get this right or your overlay scale will be completely wrong. Mine's in Imperial so that's what I'll be showing. NOTE: The size of the NL2 workspace is 5000 feet or 1524 meters. If you want your overlay to fill the whole thing, zoom and remeasure it until the Map Length is as close to 5000ft/1524m as possible. I've already done that in this case. 6. Close the Ruler window, first making sure you have the exact Map Length noted somewhere. Click on the Save Image button on the toolbar above the view window, navigate to your NL2 folder in your Documents, and name and save the image. You can close Google Earth Pro now. 7. 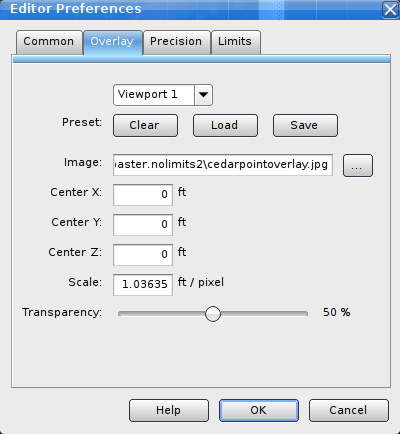 With a calculator, divide the exact Map Length by 4800 (the size of the overlay image). This will give you the scale in feet/meters per pixel that you'll need in NL2. Don't lose this number. 8. Open the NL2 editor. Go to File>Preferences and click the Overlay tab. 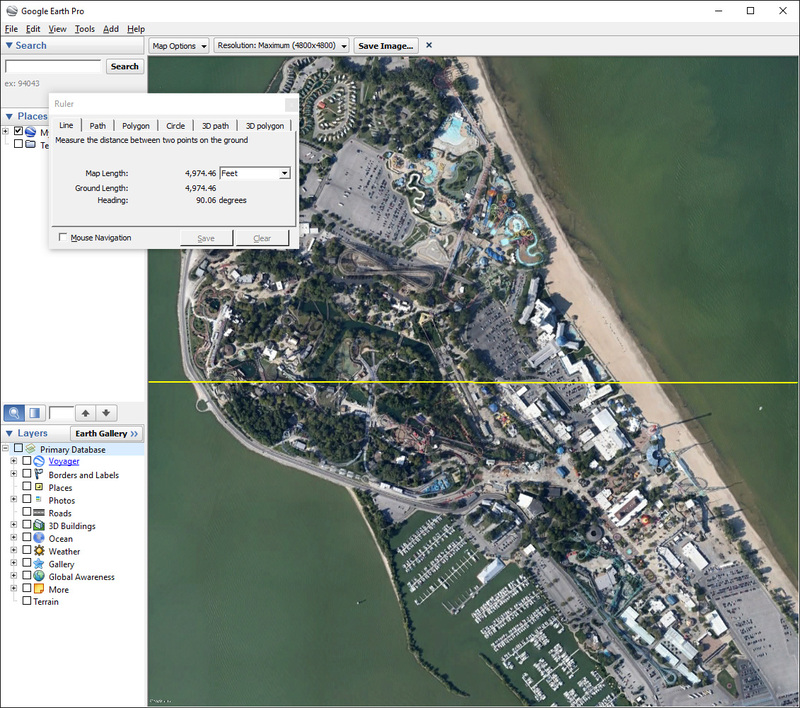 Open the image you saved from Google Earth Pro earlier, and put in the Scale you calculated. Leave the centers at zero, for Transparency I recommend 50%. Don't click OK yet, you need to save the overlay setup! 9. 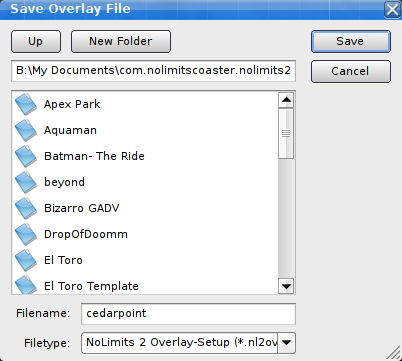 Click Save under Preset, name and save the overlay. You can now get it back whenever you need to by coming back here and loading the .nl2ovl file you saved. 10. Finally, click OK in the editor preferences window. You're done! The overlay should appear in the first viewport! If it doesn't, click Display and enable Draw Overlay. In this case it's almost exactly the size of the NL2 workspace. To show just how high-resolution these overlays are, here it is zoomed in to show Mantis/Rougarou, Iron Dragon, and some of Millennium Force and Top Thrill Dragster. 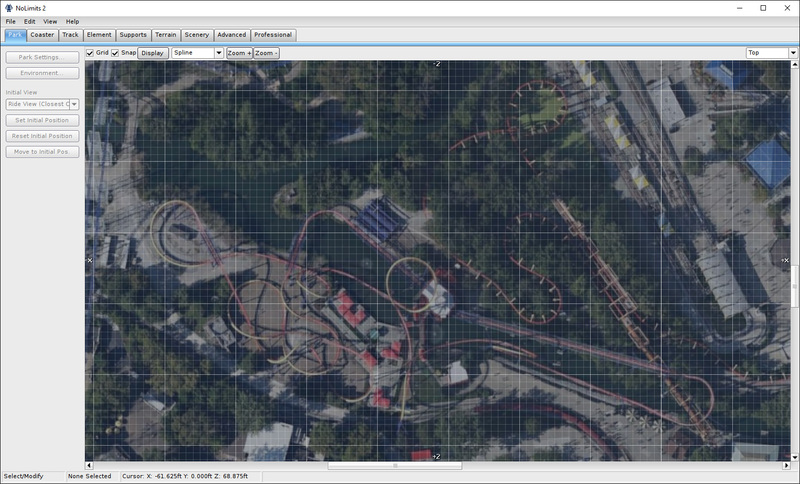 This is for a whole park overlay, if you're doing a single-coaster overlay the resolution will be ridiculously high! Last edited by Dusso Janladde on March 26th, 2016, 10:37 pm, edited 1 time in total. When was the last time they updated those satellite images? It shows the Imagery Date at the bottom of Google Earth. 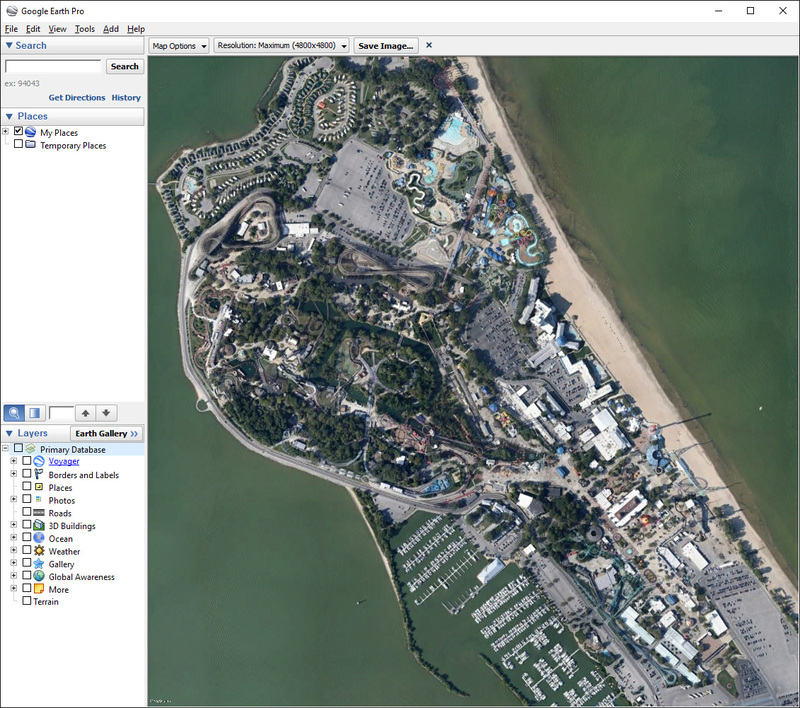 Right now, the Cedar Point imagery is from 2012, so a bit old. Thanks for the user-friendly tutorial, Dusso! This should be sticky forever! Great tutorial Dusso, this'll be helpful for many people I suspect! Awesome tutorial but how can you fine tune the zoom? I either zoom too much or not enough. Great tutorial. How would you do the calculations if your “map” wasn’t a square? Suppose I have a scan of a rectangular blueprint where the scale is 1 inch = 20 feet and the page dimensions are 23.93 x 52.70 inches. How would I scale this so that NL gives me an overlay of the correct dimensions? Then I could just build the coaster on top of it. You will need to find out the dimensions of your scan in pixels. 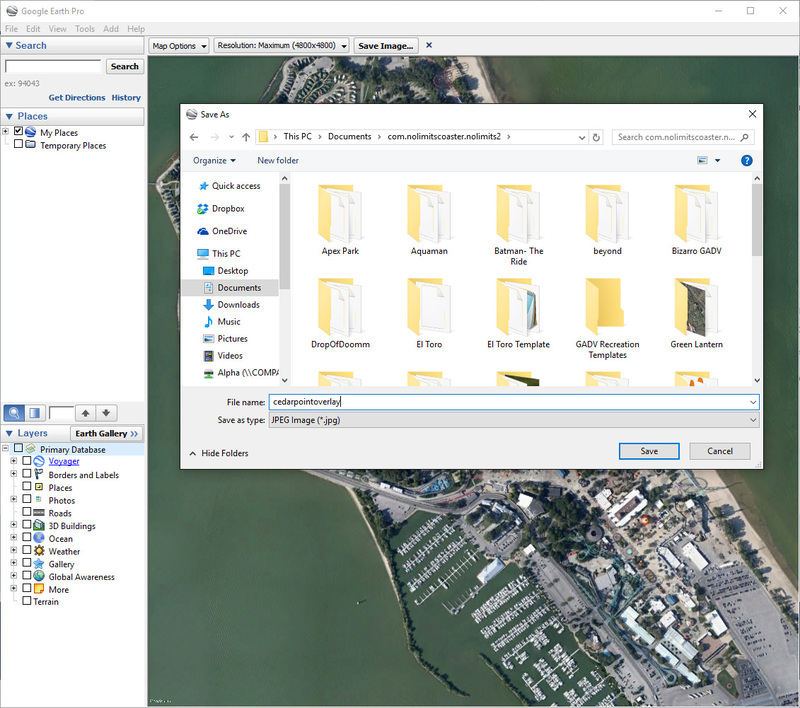 You should be able to do this with any image software (and actually if you are using windows you can just select the file from explorer and it should give you the dimensions). This assumes that your picture ends exactly where the page ends and the scan is perfectly flat. These dimensions give you the "resolution" that Duso uses for step 7. Your scaled blueprint length is 29.93 x 20 = 598.6 feet. 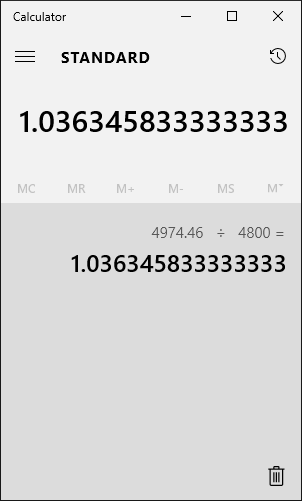 so 598.6/4500 = 0.13302 <- input this into your scale in part 8 and this should work. You can easily check by finding something of known length and drawing a NL support beam to measure the same distance (make sure it's a flat beam!). As I said this assumes your scan is perfectly flat and cropped correctly, when you do this check you might find it worthwhile to tweak the value slightly to get 100% accurate.